Peaches and strawberries...sweet, juicy and oh so beautiful! First up are the peaches...Yum! It's a single crust Peach Pie. All the elements of peach pie but I saved calories but using just a top crust. Who would miss the botoom crust when they have this in front of them? Hmmmm? Topped with a scoop of Breyer's peach ice cream and still warm from the oven. Still bubbling. Do you see that flakey crust? It's that Perfect Pie Crust I told you about here. I made 12 pie crusts to put into the freezer in under 30 minutes for pennies compared to the purchased crusts and I promise, once you try it, you'll be hooked. Each recipe makes 4 pie crusts. I just wrap thoroughly, place in a zip loc bag and freeze until we get a pie craving. A great time saver during the holidays too. The recipe is at the link at the top of the page. Next up are the strawberries. I used the same sketch from SCS SC344 that I used yesterday. Card size - 5.5" x 4.25"
Tomorrow's Saturday...go make some pie crust then let me know how you like it! Last night my mojo just decided to take a hike. I fiddled with this card for two hours before giving up and heading to sleep. This morning, those same elements came together in a card I've decided I can live with. I used the Sketch Challenge SC344 from SCS as well as the color challenge CC334 - Basic White, Going Gray and Tempting Turquoise. I didn't have anything to work with the bright turquoise but I did have a scrap from an old SU pack. (can't remember the name). I left off the sentiment because I thought this could work for anything from birthday to wedding/anniversary or sympathy. Good one for the stash! Just realized that you need to click the "x" to see this photo. 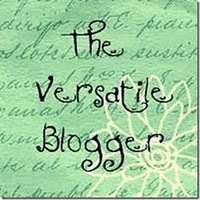 I also want to thank Dotty from Dotty A Cards and Things for the kind Versatile Blogger Award. Less is More - I know you all probably already know about this one but I just found it and love the challenges. I need to work on my CAS skills. Entering Kathyville - Kathy has a delightful style and rocks CAS, too. Inking in Red - The awesome Anne who loves Red but dabbles in other color as well. 2. I usually stamp late at night. I feel "guilty" stamping during the day because I love it so much it feels more like play than work. 3. I mill my own wheat for flour. 4. I used to make my own clothes...not so much anymore. Now my sewing is mainly in the craft category. 6. I like to weed. It's a mindless activity that I find relaxing and it's instant gratification. 7. I've been married 42 years...that's a lifetime! That's it! Have a lovely Thursday and try to stay cool. We live in a tropical area so we're used to it but we feel for those of you who aren't. Drink lots of water!